I am continually inspired by the ideas and innovations that come from the amazing people I meet. Recently, I had a draw at a networking event for a ‘Visibility Pack’ which entitled the winner to a feature on my blog, newsletter, and a mention to my social media tribes. This post is about the winner. Claudette and Carola didn’t start out as entrepreneurs. Two great friends went on a road trip together, and came back with the idea and commitment to start a business. Claudette Fitzsimmons and Carola Bouchard launched ‘Bosom Buddies’ after they discovered a revolutionary new silicone bra that is strapless and completely backless. This story is not so much about the bra, but about the evolution of an idea, and turning it into a viable venture. When the ladies encountered the unique bra product, they were amazed at the comfort, movement, and freedom the bra provided. This was too good of a product to keep to themselves. They immediately set out to find a supplier who could produce a high quality product at a reasonable price. After testing numerous samples, they came up with the ideal source. Then the overall business and marketing aspects had to be considered. They became business partners, and came up with the name ‘Bosom Buddies’, which was appropriate for the product, but also for their relationship as great pals. Now that they had a great product, what was the best way to get it to market? 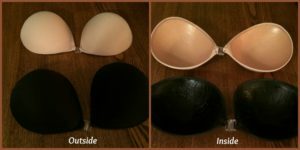 Their bra product is a different concept from traditional bras, so it takes a little education to describe the product, the sizing, and how to wear one. Home parties, tradeshows, and personal consultations were the answer. The obvious benefits to women who first see the bra, are the fashion options they can consider when wearing one, such as strapless or backless tops or dresses, tops with lacy backs, or tank tops with tiny straps. 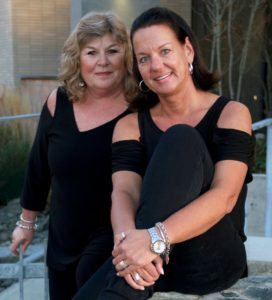 Claudette and Carola also realized that there were health and emotional benefits that they could address. Because of physical limitations, some women have great challenges when trying to wear normal bras. They can’t manoeuver the awkward fasteners and straps. Shoulder straps can be a burden for some women, cutting into their skin, and being constantly uncomfortable. With no stays or underwire to block lymph drainage, Bosom Buddies bras can reduce cancer concerns. Presenting such a personal product means each customer gets respectful care and attention. When people get comfortable at a home party, and try one on under a top, they are pleasantly surprised at what they see, and love how they feel. They come out and parade in front of the others, and the excitement builds with the other ladies. Personal attention to each lady’s needs is the key to Bosom Buddies’ success. Bosom Buddies kicked off in 2015. Carola and Claudette have the right product, have been testing the market, and slowly growing their business. 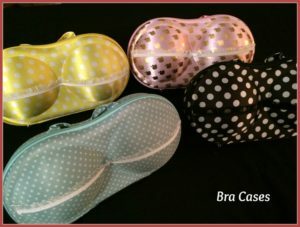 They added a beautiful line of ‘Bosom Buddies Bra Cases’, which provide a place to store the silicone bras, and are ideal for travel. These two bosom buddies are ready to take their business to a new stage. They’re speaking with a business coach, social media experts, web and graphic professionals, and other business resources. Currently doing business locally in Victoria, they’re looking at how they can scale up their operation to share their innovative product with more women on Vancouver Island. Are You The Next Business Showcase? In 2017, I will offer more opportunities to be showcased. Sign up for my newsletter to keep up to date with opportunities to get your business some online Visibility. Your business can be featured in my blog, newsletter, and social media tribes.